A customer card will always remind the customer of your company and the advantages of a „long lasting relationship“. The big advantage compared with a direct discount: In order to receive the bonus the customer needs to visit your business more often. Combined with clever marketing activities you will be able to increase your turnover. Who still believes that a loyalty card system is only meant for the big enterprises doesn’t know our system yet. No matter if you run a small grocery store, a specialised store or if you run a small chain: Without great effort you can realize your own customer card. 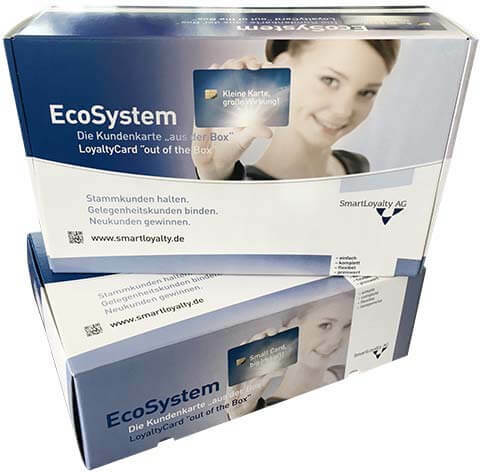 The system consists of high quality customer cards that will be printed in your own design and a terminal that allows you to give points to the customer up to your own requirements. The optional software allows you to evaluate all the transactions. You only need a power supply and, if you choose the software, a computer for the data evaluation.